Out of an abundance of caution I have deleted this mornings pattern. I received this email and thought I should share it with you. I advise you not to use the pattern. Being a medical man, I feel a compelling urge to strongly advice against your project: Bang head here – stress therapy. It is a well known fact that banging your head against the wall may cause severe brain damage and it most certainly does not have anything with stress therapy to do. A normal person may consider this to be funny, but mentally disturbed people or children react differently and may try out this project just for fun. For patients with potential vascular disorders, any banging of the head against a wall could mean disaster. Take my advice, remove this project and advice against it’s potential dangers. Other than this, I enjoy your blog. There are a few different ways to set the angle of your scroll saw table. One method I use a lot is the protractor behind the blade. 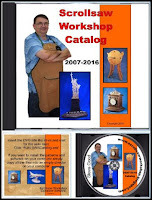 Long time reader Lori Scott sent me an email tonight with a link from woodsmith magazine. 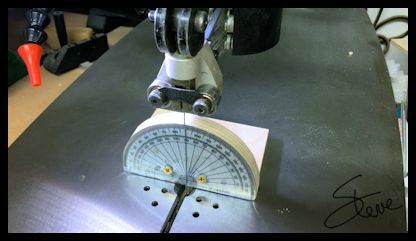 They had made this handy little protractor holder for a band saw project. I went right to the shop and made one. It might not do something magic but it's just that little extra ease of use that's worth the 20 minutes it take to build the jig. The following video shows a couple of issues I had. I though I would share so you can make your own. If you don't already own a protractor make sure you get one small enough to fit under the upper clamp. Pegas Modified Geometry. I am a minimalist when it comes to blades. I cut 95% of my projects with a #3 or #5. The Pegas modified geometry just last longer than any blade I have used. They stay sharp longer. The drift of the blade is minimized because of the way they are made. I think this makes them easier to learn to use of you are just getting started. 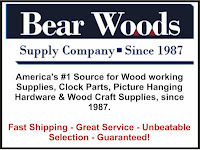 Bear woods is a sponsor of my monthly giveaway and I get free blades from them. You can consider that when you read this. There are people out there who swear that the blade they use is the best. We all have personal preferences. That's good. All I can say is that if you are unhappy with your current blade or just want to experiment then give these a try.